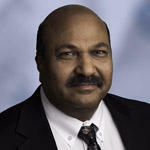 Dr. Omkaram (Om) Nalamasu is senior vice president and chief technology officer (CTO) for Applied Materials. He brings extensive experience and passion to the role of CTO, where he is leading the development of new product pipelines, securing government funding for key strategic projects and building a world-class team to maintain Applied Materials’ technology leadership in the industries it serves and enable growth into new markets. Dr. Nalamasu is also the president of Applied Ventures, LLC, the venture capital fund of Applied Materials, overseeing the financial and strategic investments in early and growth-stage privately held companies. A world-renowned expert in materials science and technology and one of our industry’s respected forward thinkers, Dr. Nalamasu has championed a renewed focus on the company’s innovation culture through various internal development programs and open innovation methods. He has strengthened Applied Materials’ strategic relationships with universities and research institutes around the world including IIT Bombay. Dr. Nalamasu joined Applied Materials in 2006, after serving as vice president of research at Rensselaer Polytechnic Institute (RPI). He has held key research and development leadership positions at AT&T Bell Laboratories, Bell Laboratories/Lucent Technologies, and Agere Systems, Inc., and was director of Bell Laboratories' Nanofabrication Research Laboratory, MEMS and Waveguides Research, and Condensed Matter Physics organizations. His research interests include nanomanufacturing, nanopatterning, electronic and photonic materials, and lithography, with special emphasis on applying patterning and materials know-how for device fabrication for electronics, photonics and energy applications. Dr. Nalamasu has made seminal contributions to the fields of optical lithography and polymeric materials science and technology. He has received numerous awards, authored more than 180 papers, review articles and books, and holds more than 35 patents. Dr. Nalamasu is a member of the board of directors of Semiconductor Research Corporation and The Tech Museum, and serves on the National Academies Panel on Materials Science and Engineering. He sits on several technical advisory boards and university advisory committees, and received his Ph.D. from the University of British Columbia, Vancouver, Canada.